Having a lawn that your neighbors are envious of doesn’t come easy. It takes the proper seed for your soil composition and sun/shade situation, adequate hydration throughout the growing season, mowing and trimming, and proper fertilizing to ensure your grass has the nutrients it needs to thrive. Applying fertilizer helps produce a deep green color and dense turf while minimizing irritating weeds. However, choosing the right fertilizer and how much to apply can be tricky. Too much can cause serious damage to your lawn and not enough fails to produce your desired results. Kable Landscaping has the knowledge and expertise to fulfill all of your fertilizing needs and have you seeing green. The obvious benefit to fertilizing your lawn is the dense and vibrant turf it produces. It can also help eliminate unsightly weeds and increase your lawn’s water uptake. Through professionally applied fertilizer application, lawns become stronger and weed growth is reduced over time. If you’ve ever been interested in making a fresh start with your lawn by investing in new turf, adding in fertilization as a method of strengthening your lawn is a great way to secure its health and appearance. 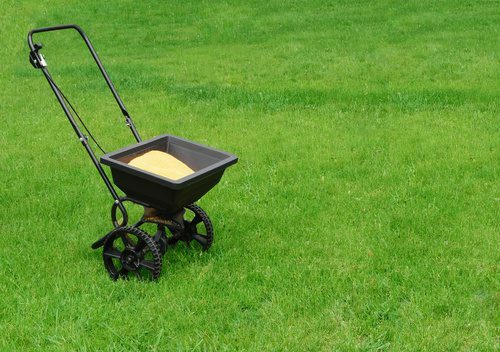 Believe it or not, fertilizing your lawn is a very clean, mess-free process. Because one of the major benefits of the fertilizing process is to aid in water absorption, you may see fewer collected puddles of water on your lawn from excessive rainfall. One of the major concerns people have about fertilizing is the belief that it causes pollution or is toxic. However, the chemicals used to fertilize lawns specifically target the areas they’re supposed to protect without getting into unwanted areas. If you’re ready to explore the benefits of fertilizing your lawn, call Kable Landscaping today at (989) 695-5222. We look forward to hearing from you!